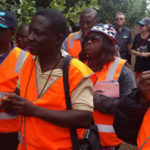 A group of 20 extension workers and people in farmer and marketing groups in Ghana visited Victoria and South Australia last month as part of the Ghana Farmer Based Organisation (FBO) study tour. At the end of the tour, the Crawford Fund supported a final ‘feedback day’ at which the Ghanaians presented what they had learnt and how they may apply it when they return home. how they may improve the research program and have it driven by the farmers rather than the scientists and government having seen our research and development arrangements. Australian FBO’s involved from SA and Victoria included Southern Farming Systems, Birchip Cropping Group, Mallee Sustainable Farming Group, and the Hart Field Site Group. This was complimented by visits with the Department of Environment and Primary Industries at Geelong, Horsham and Mildura; Rural Solutions SA at Loxton, as well as visits to a range of farms, and attendance at the GRDC Advisor Update in Adelaide. 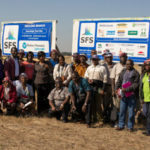 “The group were most impressed with the active participation of farmers in the operation and direction of FBO’s in Australia and the close linkages they were able to maintain between farmers, Government extension workers, researchers and private industry servicing farmers and the rural community. 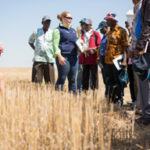 Of particular interest was the high level of involvement of women in the work of FBO’s in Australia,” reported Ian Mitchell, from International Agriculture for Development, who facilitated the training. Ian noted that it was widely accepted by all involved that feedback day was significant in enabling the participants to crystalize what they had learnt and to begin to formulate plans for how they might turn their observations into concrete actions for change and development on their return to Ghana. “It is evident that the group will return to Ghana with new ideas and increased motivation to develop and inspire the evolution of more effective FBO’s in Ghana, and through their work to move closer to achieving food security for their country,” concluded Ian.